Fashions come and go with food as much as they do with skirt lengths or trouser widths. The American muffin has never quite recovered from its unfortunate associations with the bit of untrained stomach hanging over the top of a waistband, now fetchingly referred to as a ‘muffin top’. We have moved on, through the cupcake, to the whoopie pie. I’m still a cupcake fan myself, although do prefer the name ‘fairy-cake’ or plain old ‘bun’, which must of course, be said with a Yorkshire accent for the correct effect. One food that has never been unfashionable is the macaron. French, light and beautiful, they come in the colours of the rainbow and sophisticated flavours such as rose and pistachio. Parisian favourite Pierre Hermé is as much part of my annual Parisian pilgrimage as Chanel. The grande dame of the macaron, though, is of course, Ladurée. The company has several locations across Paris and now the you can order online from Harrods in the UK, making them a treat accessible for me on a more regular basis, hurrah! Although I’ve indulged in these beauties on many an occasion, I’ve never attempted to make one. It has taken two days (although a considerable part of that was leaving things to rest in the fridge) but I have finally finished my attempt to make the beautiful macaron. 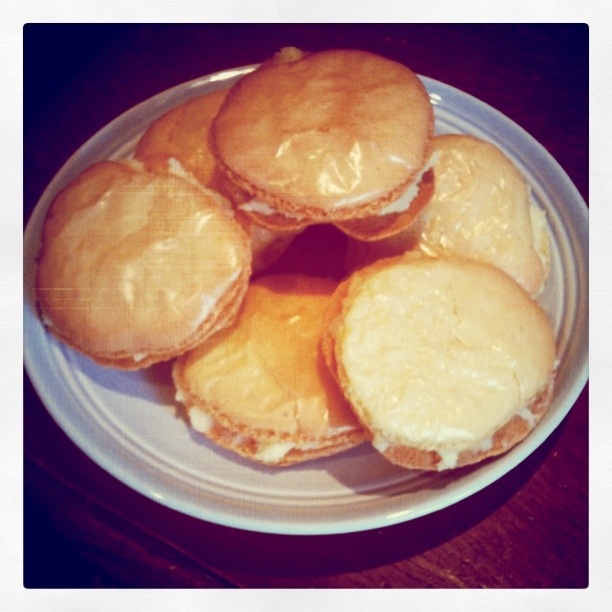 I used a recipe from Ladurée, which was published in the Paris edition of Stylist magazine. Ladurée Macaroons Citron / In This Week’s Issue / Stylist Magazine. Although mine don’t quite look like the ones in the magazine, I’m still pretty pleased with them! 6 Responses to Stylish and sweet. Thank you! They do taste pretty good. Worth all the effort it takes to make them. Thank you! Partly the reason I do lots of exercise (apart from the fun) is because I’m basically greedy! To, two days to wait, but not very long to eat! Thank you! Not very many left now…have to make some more!